SkyBox SBX5048-120/240 SkyBox Grid-Hybrid Inverter makes smart solar simple with an advanced technology single-box design, and represents a breakthrough in the field of advanced power conversion, processing and control. The fully integrated design of the SkyBox system eliminates external charge controllers and communication boxes, significantly cutting installation time and cost. Ease-of-installation makes this energy solution ideal for anyone interested in following the market’s move towards battery-based systems. 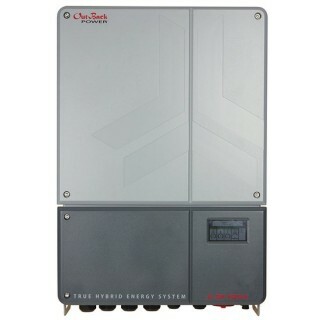 The SkyBox SBX5048-120/240 hybrid grid-tie inverter can be used with or without a battery. When used with a battery it can be used to enhance self-supply of solar energy. This is useful when net-metering or grid feed is not available, or not financially advantageous. This system uses DC coupling for both the solar and the connection to the battery system for greater overall efficiency. The SkyBox uses any commonly available 48 VDC battery bank (lead type, flooded, AGM, or gel, and many Lithium batteries). Solar - Harvests photovoltaic (PV) energy from a PV array using maximum power point tracking (MPPT) technology. This energy can be used to run loads, for battery charging, for grid-tied activity, or for other purposes. Grid - Connects to the utility grid to charge batteries and run loads. It can also sell to the grid, or interact with the grid in other ways if sell-back is not permitted. Load - Uses an inverting function to convert battery (DC) power to AC output. It can run loads in the absence of an AC source. If an AC source is present (utility grid or generator), the SkyBox can switch to run loads directly from the AC source. The inverting function can also work with the utility grid. It can add PV and battery power to support loads (self-supply) if the AC supply is not large enough. It performs similar activity for the grid-interactive (sell-back) and GridZero functions. It can also “AC couple” power from another grid-tied inverter to the grid. Battery - Uses a battery source to run loads, minimize consumption of grid power, and other applications. It uses a three-stage cycle to recharge batteries. It can also monitor usage and track the battery state of charge (SOC). Generator - Control a generator to run loads and charge batteries. The generator can be started with a manual command or programed to run automatically with the Advanced Generator Start (AGS) function. The generator can start or stop according to battery state, time of day, or several other external conditions. PV input voltage range is 200-600VDC, allowing longer PV strings. Compliant with California Rule 21 and Hawaii 14H grid support requirements.